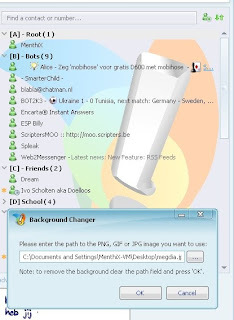 Background Changer is Messenger Plus Live script that allows you to change the background of your Windows Live Messenger contactlist with an image or photo. - Make sure you have Live Messenger and Messenger Plus! Live installed. - Download the script, open it, accept the warning and press Import. - Click on the Messenger Plus! logo in your contactlist. - Click on Background Changer > Change Background. You must have Messenger Plus! Live installed in order to import this script successfully.